Brilliantly obscures imperfections and dark spots with a creamy, vitamin-rich formula that nourishes the skin for all-day wear. Crease-proof and easily blendable for a flawless, long-lasting finish. I have been on a quest for the perfect concealer for a long time. After a lot of looking around, I picked up the Bobbi Brown concealer-corrector combination, but while it was sort of okay for under the eyes, it didn't work for covering blemishes. It did give me a better idea, though, about what I wanted in my concealer - a stick/cream consistency and opaque enough to cover my blemishes without having to cake on the product. With that in mind, I picked up the NARS concealer that comes in a twist-up stick formula (not the creamy concealers that come in a lipgloss like packaging). I use two shades - Caramel and Biscuit - both meant for medium-dark skin, with Caramel being the darker/yellower of the two. 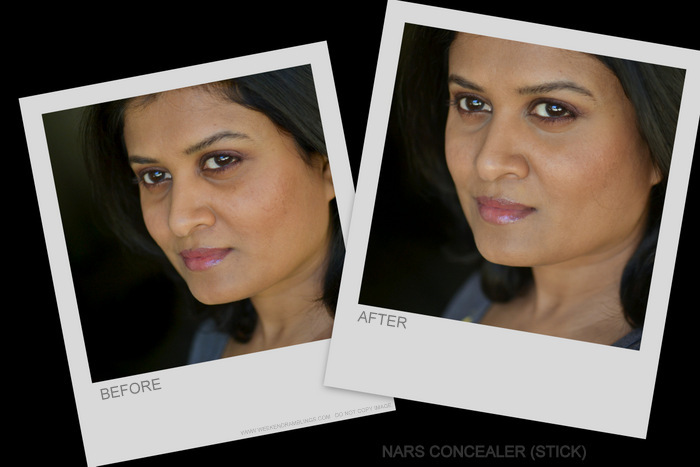 NARS concealer (the stick version) comes in a twist-up pencil form. The formula is like a soft pencil. I use two of the shades - Caramel (medium dark natural balance of pink and yellow undertones) and Biscuit (medium dark natural balance of pink and yellow undertones - lighter). Not everyone would need two shades, but I have uneven skin tone so two shades work better for me. I have a lot of dark pigmentation under my eyes, especially towards the inner corner, and Caramel works better at concealing this area. Biscuit is closer to my skin tone and works better at concealing blemishes. A shade between the two would be ideal, but for now I am happy using a combination. Here's a look at the swatches and how it works on me. NARS Concealer in Caramel and Biscuit with Nars Tinted Moisturizer in Annapurna and St. Moritz for shade comparison. I use a mix of St. Moritz and Annapurna. These NARS concealers are definitely my favorite now. I found the mix of pink and yellow undertones perfect for my skin tone. The consistency of the concealer is not too creamy which makes it long lasting. It's richly pigmented, and I don't need much product to cover up blemishes - no cakey appearing patches. I use a thin brush to apply the product only where it is needed rather than a fluffy brush to apply it all over, and I found the formula perfect. I have oily-combination skin, so the slightly drier texture is perfect for me. Someone with drier skin might do better with the creamier liquid version - Nars Radiant Creamy Concealer. I picked up NARS Concealer Stick in Biscuit from Sephora and Caramel was provided c/o of Izzy's. Links provided are NOT affiliate links.